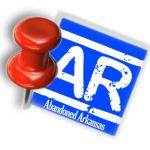 Originally maps on Abandoned Arkansas were free, but because of vandalism to some of our locations, we decided the only way to protect the properties but still provide the responsible readers of our site a way to have access to this great resource was to charge a small fee and record your contact information. So with your purchase of Map Privileges, you will have access to the Master map, as well as the maps on each individual location post. • Your Shopping Cart is Empty.